The air ducting limit is the least known installation restriction for Eberspacher air heaters. Eberspacher ducting limits are not mandatory, they are guidelines for good reliable installations and it is easy to assume that the ducting specification is unimportant. However ignoring them might result in rapid or progressive damage to the ECU or the motor, both of these components are very expensive to replace. The airflow resistance from the ducting produces a back pressure making it harder to blow air through. You can demonstrate this by blowing through a 10 cm length of garden hose then compare that with the full length where it is very difficult to blow through and you will see what I mean. A heater with ducting that does not meet the guidelines will often continue to work but may fail prematurely for the following reasons. The blower motor has to work harder to maintain its rotation speed. This causes more mechanical wear leading to earlier failure, plus it will take more power from the battery. The increased air resistance reduces the quantity of air passing through the duct. The heated air is hotter as the same amount of heat has to be transferred by a lower quantity of air. The heat exchanger will be hotter, which combined with the reduced air flow through the heater means more heat can build up in the ECU and the blower motor, sometimes causing failure in the long term. Air will also exit the duct at lower pressure so it disperses less in the cabin, giving more localised heating. If the heat exchanger temperature becomes too high the overheat sensor will trip and this is usually the first time users learn about ducting limits. Many more will reach a temperature slightly below the limit, continually cooking the ECU and motor, not good for reliability. In extreme cases the excessive heat transfers to the ECU which causes it to overheat and fail. It can also melt the plastic impeller as in this installation where both of these occurred. Right angle hood together with very sharp bends caused ECU failure and melted the plastic impeller. This was the result of a ducting modification intended to allow more convenient access to the heater which was mounted in an inaccessible place. The heater had to be replaced. I have only included these so anyone who wants to check can see how I came up with the figures for the various ducting equivalents. The calculations are based on the rule of thumb that doubling the duct cross sectional area decreases air resistance by a quarter. I am assuming from that rule the air resistance is inversely proportional to the (cross sectional area)2. I believe my calculations and the assumptions are correct but I am not an expert. I hope people with ducting expertise will check and confirm or improve these duct rating estimates. 50 mm ducting is not usually specified with newer Eberspacher heater models but it does show how a very small outlet or a duct restriction like a compressed duct could affect results. After installing or modifying ducting the compliance temperature test on the next page will be far more reliable than the calculations and will show up installations that have a problem. 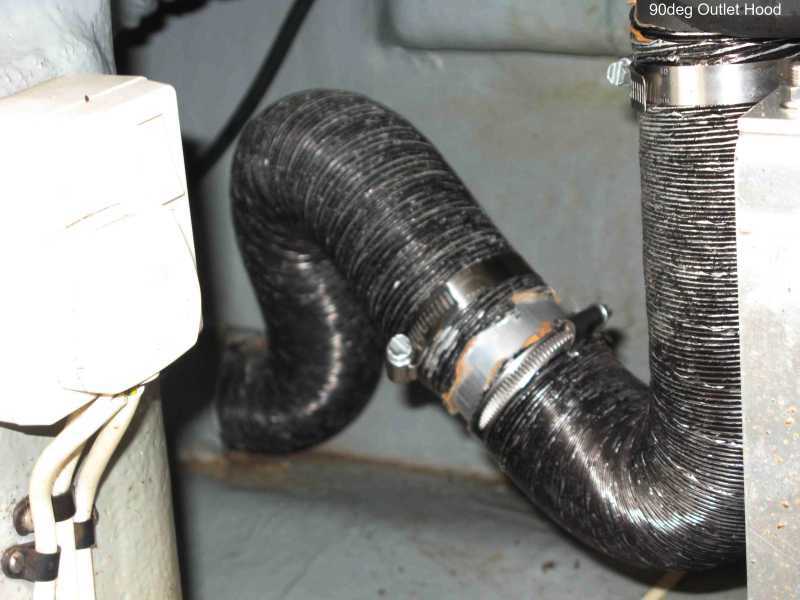 Ducting is part of the installation or modification of an installed heater process and as this is a maintenance / repair oriented website I would not normally cover it here. Eberspacher do not include ducting details in the heater technical manuals which are the main source of installation details for non dealer installers. Ideally all I would need to do would be to try to make users aware of the problem and point them to the relevant manuals. However the ducting information in those manuals is so poor I can see why that information is omitted from the technical manuals. Most users would simply give up and ignore them. It became apparent from the problems our website users have that are caused by installing or modifying ducts that our site needed a ducting section to help provide the information in a more user friendly way. I knew nothing about ducting and had to start from the ducting manuals. The poor quality and accuracy of Eberspachers information means these pages are way below the high quality of other pages on our site. They are the best I can achieve but they will provide a starting point. Several years ago I tried to understand Eberspachers ducting and gave up. It is only recently I have tried again. This time I came extremely close to giving up and abandoning these pages, it was only because I have spent so long trying to sort them out that I decided to publish as is complete with lots of conflicting information. The Eberspacher ducting pages are very confusing and still riddled with errors, omissions, inconsistencies and poor proof reading. Eberspacher really require to give them a complete overhaul by someone who understands ducting, and not give it to someone on a work experience attachment. The basic concept of ducting ratings is very simple to understand so why have Eberspacher managed to make such a complete mess of the ducting pages. It is the figures and in particular the way they are given, or often not given, by Eberspacher manuals that makes them so difficult to use in practice. The component ratings tables in the manuals are unnecessarily complicated with columns for both 1 and 2 duct figures. What users require is a simple rating value for every component in a single duct installation, not just those shown as singe duct in the drawings. Figures for dual duct might be included as well but it is easy to divide single duct figures by 4 for dual duct systems. Splitters need 2 ratings, one for each outlet. Size changers also need 2 ratings, one for step up, one for step down. My single column versions should be far simpler to understand. I have also changed the drawings layouts to make them more easily understood at the first visit to the ducting pages on our site. Then while looking for missing ratings I found older manuals give completely different ratings for the same components. These give me no confidence in any of Eberspachers ducting figures and my suspicions are that in practice they are not used by Eberspacher or dealers. My guess is they have a number of working examples that pass the duct compliance temperature test (next page) and use them as a starting point for new installations. Where the two values given are widely different I have included both. In some cases I have tried to guess likely figures, these unconfirmed figures are marked with a ‘?’ after the rating, others marked ‘?’ I have no idea, your guess is as good as mine. There are many inconsistencies that cause confusion to new readers, eg in their manuals Eberspacher have several different names for the same part, Spherical reduction hood, Reduction hood, Swivelling hood, Ball shaped scoop, 90 degree outlet hood. (I could add one more as I call this part ‘Heater outlet hood’ on our own web pages). The other part names I have used correspond to those in Product Catalogue Manual parts section which are once again different from those given in older manuals. There are several different manuals with ducting information. The most up to date ones which are the main basis for the information published here are the Eberspacher Product catalogue 2016 & 2017. That catalogue also contains a section showing physical details of the parts. It will be worth downloading even if only to compare it with our site and let me know if my changes actually help. Some details are taken from other Eberspacher manuals. I have also extended the information beyond that given by Eberspacher, trying to fill in an area where there is a serious lack of details. Note I am a relative novice in ducting, not an expert, and these are my best attempts to try to simplify the Eberspacher manuals. I may have inadvertently introduced more errors by my interpretation of them. These ducting pages should be treated as very tentative. Please do not contact me asking for ratings of components not shown as I will not know the answer. One point that may cause a little confusion to some users is that the same size pipe can have different ratings depending on the heater outlet hood size. ie With a 60 mm hood 1m of 60 mm ducting will have a rating of 1. With a 75 mm hood 1m of 75 mm ducting will have a rating of 1. The ratio between the original duct csa2 and the replacement duct csa2 gives the equivalent rating factor. The inverse of that ratio gives the length that can replace 1 m of the original ducting.